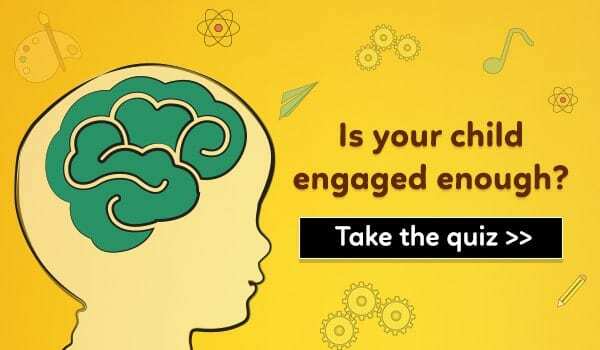 All we need to do is introduce them to a few outdoor games that we played as children, add some more ‘intelligent’ ones for them to improve upon, and we’re set. The idea is to convince them that playing outdoors is anytime more fun than breaking our heads over electronic games. Before we enlist a few outdoor games, let’s first quickly learn how to engage children outside. 21 ideas for outdoor games for your child to have fun! Ever heard of the Hindi idiom bali ka bakra? It simply means scapegoat. This one is a child-friendly and funny version of trying to ‘tag’ one person as the scapegoat. A minimum of three players are required to play this outdoor game. By toss or mutual agreement, one person (the first scapegoat!) goes first. He/she closes his/her eyes and counts to 10 while the others spread out in the open area. All players need to be visible to the person who is counting, so the distance between the players and the raider cannot be too much. If your child is counting first, ensure that the distance between him/her and you is minimal at first. We want them to be involved, not scared! Once the counting is done, the raider needs to run and catch another person to tag. Tagging is done by patting only at the back. Tapping at any other part of the body is not accepted. This is what makes this game a little challenging and fun. The next person to be tagged has to then run around to catch another person to tag. The game stops when every person has been tagged at least once. The person tagged the most number of times loses the game. Make the game flexible and customise the rules for your child as and when you want. It’s your game at the end of the day! Well, this one needs no introduction. The rules of hopscotch are ingrained in every Indian almost like the rules of cricket! However, we have a twist and our version is definitely more engaging for the smarty-pants you’re bringing up. Using chalk, draw the hopscotch pattern on any concrete floor outside. If you’re playing on sand, use a stick to draw the outline. Usually, hopscotch is a numbered pattern where each box pattern is numbered from 1 to 9 or 10. Taking turns, each participant throws a small pebble so that it stays within the boundary of a numbered box. As the game progresses, each player hops from one box to another. 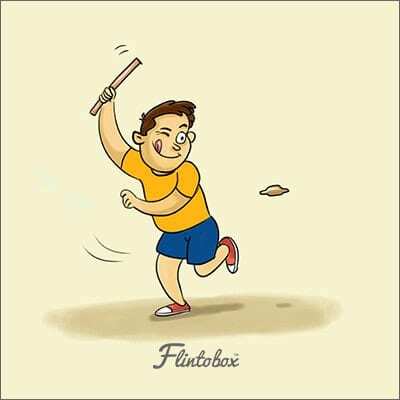 Whoever reaches the highest level (throwing the pebble in the box with the highest number), wins. The person to have reached the highest level gets to draw another box, with the next higher number, for the other players to cover before they can win. So basically, the winner is making it tough for the others to win. Let your child win this one and add as many numbered boxes as he/she wants. Sneaky way to practise numbers, no? This one is for the little boys and girls who enjoy pretend play. We indulge in quite a few pretend play activities indoors like playing house, doctor, and chef; so this one is for outdoors. Within a team of minimum three players, taking turns, assign a player to play the cop and other players will pretend to be vehicles. You can take the role of a pedestrian. 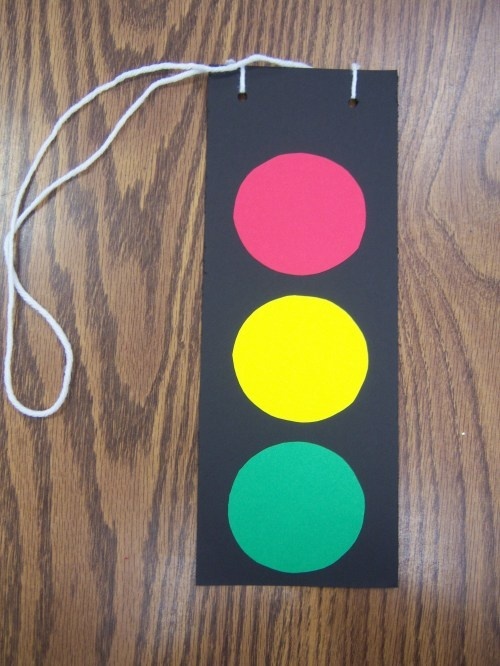 Use handmade craft traffic lights to play this game. The policeman directs traffic and stops vehicles to let pedestrians go and vice versa. Play in an open and safe place so that the pretend traffic has enough space to navigate. It’s a fun way to teach children about road rules as well. You can let kids use their toy cars, bikes, or any other vehicle that they own and let them experience a pretend day on the pretend road! This game needs a little preparation and can be played as an indoor or outdoor game. However, playing it outdoors, especially in a garden, means more fun and less mess. Place several marbles in a huge bucket or tub and fill it with water. You can use a toy swimming pool as well. The person who gets the most marbles out of the water in a minute’s time, wins! The rush to hunt for the marbles and the messy play with water makes this game a riot of giggles. Don’t agree? Try it on a hot summer evening and see! Don’t move or you’re out. The run and statue game is a favourite among outdoor games that kids like to play. By toss or mutual agreement, one player goes first. He/she is supposed to say ‘statue’ when everyone is running all over the place. As soon as the word ‘statue’ is said, the runners have to stop immediately. The smallest movement, and you’re out! It’s best if a parent says statue and lets the kids run around. I’m sure we and the kids, both prefer that! Looking for easy outdoor games? Nothing beats this one! The catch-me-if-you-can game is probably older than the Ramayana and is always fun to play. 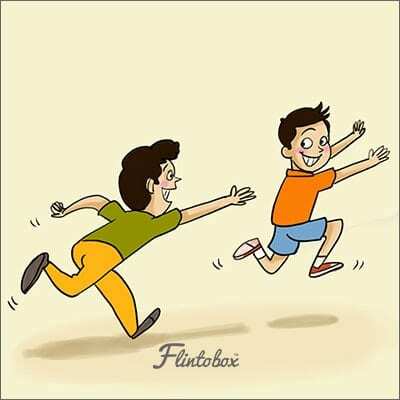 Within a group of two or more kids, one kid needs to catch the other(s) and whoever gets caught first, runs and catches the others. We keep running and catching like cats and mice. This can be a never-ending game till mom calls us inside and curfew begins! Except that the letter is more of a piece of cloth. This is one of those outdoor games in which children of all ages can be involved. The players keep singing the song as they play. The players sit in a circle and there is no limit to the number of players that we can include. By toss or mutual agreement, one child starts to run outside the circle with a small piece of cloth (the size of a hanky) in his/her hands. The person who is running has everyone’s back facing him/her. While running, the runner has to drop the hanky behind anyone and tap the person’s back to indicate the letter delivered. The player who now has the hanky has to run and catch the first player (who dropped the hanky behind him/her) before he/she finds a place to sit within the circle. The game continues till everyone has had a chance to drop the letter or when players are too tired of playing! This is the conventional treasure hunt, but with a twist. Get kids to make paper flags beforehand. Choose a comparatively large area/field to play this outdoor game in. Place flags and mark different corners of the playing area as castle, garden, treasure bank, pond and so on. This is pretend play so you have to imagine the various landscapes even though they’re not actually there. 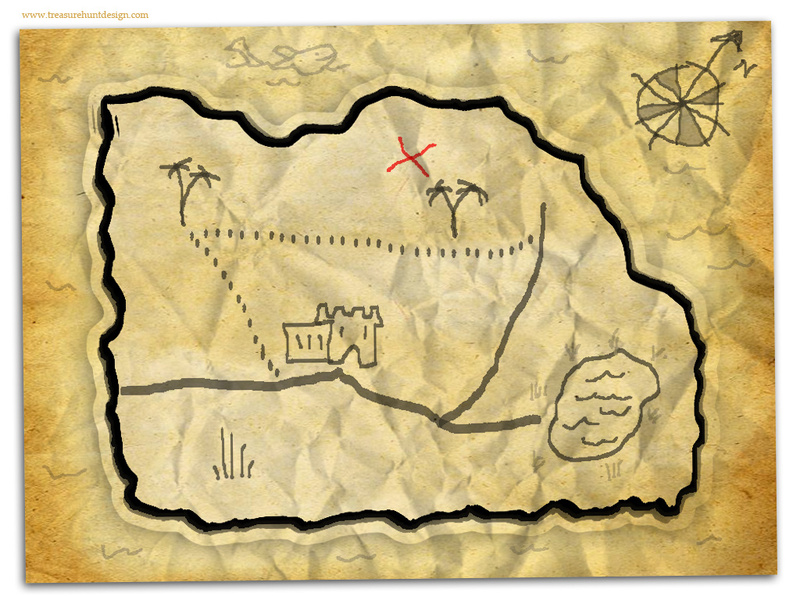 Make a map on a piece of chart that shows on which corner the treasure bank can be found. This will be a very basic map in which ‘X’ marks the treasure spot. This game is best played in a large area so that one needs to run to reach from one marked area to another. Once a person reaches the treasure, he/she wins. Once all players have been able to plant their flags on the treasure, the games stops or you can play rounds till everyone gets a chance to save the treasure. What do call a queue of people, trying to balance on their knees; dreading to be tapped on their backs because that’ll mean excessive running all over the place? It’s called Kho-Kho! Kho-Kho is one of India’s most popular outdoor games. It’s a tag sport that was propagated mostly by the State of Punjab (just like hockey). It is played by teams of 12 players. However, you can decide your team number based on availability of people. The teams remain seated in a long line so that every alternate person belongs to the same team. By toss or mutual agreement, one team chases first and the other gets chased. You can devise your own rules of the game since we’re playing with children and can have enjoy doing that! This is one of those outdoor games that needs no explanation. Everybody has played this game. Quickly hide so that your child can seek you out and have oodles of fun doing that! The most popular street game of India after cricket, is probably Gilli Danda! It is played with a long wooden stick called danda and a gilli, which is a small oval-shaped piece of wood. Players stand in a small circle. The player who is going to hit the gilli holds it tangentially (like a see-saw) on the ground using the danda. He/she then hits the gilli to make it flip in the air. While it is flipping in the air, the player strikes the gilli again, hitting it as far as possible. After striking the gilli, the player runs to a pre-decided point (which counts as one run) before the gilli hits the ground or is caught by another player. This game can be played between two or more players and is addictive once we get the hang of striking the gilli. So, are your kids ready for a strike? Who doesn’t know kabaddi? These days, there’s even a kabaddi league on TV, which you can show to your kids to get them excited about the sport. Kabaddi is one of those outdoor games which can be nurtured for a lifetime career as well. Kabaddi is a contact sport played between two teams. The playing field is divided into two equal halves. Taking turns, each team sends a raider into the other team. The trick is for the raider to keep repeating the word ‘kabaddi, kabaddi…’ when he/she is on the opposing team’s side of the field. He/she cannot exhale till he/she returns to his/her side of the field or touches at least one member of the opposite team and returns to his/her team. If he/she is able to touch and return, its called a successful run. One successful run into the opposite team’s side wins a point. The raider is out if he/she exhales at any point when he/she is on the opposing team’s side of the court. Wrestling and physically stopping the raider to return to his/her side of court is allowed. However, we can tweak these rules of ‘physicality’ when we play with kids. So, what are you waiting for? Take a deep breath and begin! Ever seen a dog rush to a bone? Well, this outdoor game is similar to your canine’s greedy habit of rushing to a bone! 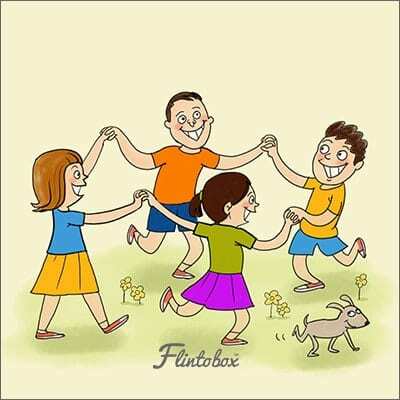 Two teams of children are made to stand opposite each other at a minimum distance or two metres. Place a ball, a large unbreakable toy, or even a bean bag between the teams. One member per team comes forward and tries to get the item placed at the centre. The player to get to the item first wins. Most number of winners from a particular team means that team wins. Are you ready to go get the bone from the middle? I am! “Ring a Ring o’ Roses” or “Ring Around the Rosie” is a nursery rhyme plus one of the oldest outdoor games that involves singing. I’m sure you’re singing along as you read! Tap the shoe or Shoe is one of those outdoor games that even our grandfathers must have played. These days however, it has lost it’s appeal. Why not try playing to revive it? All players stand in a broad circle and try to tap on the shoes of the person standing next to them. The rule is that they cannot leave their spot while tapping and also cannot touch another person with any other body part. Once tapped, that player has to leave the circle so eventually we are left with two people, one out of which wins! Make you kids wear their shoes and begin the tapping, now! As a child, this one was my favourite garden game. It involves dance and drama and lots of fun! On two sticks (or poles if available), vertically placed a metre apart, tie a strong rope or string. The height of the string should reach your child’s neck in the first round. Play music using a phone or a handy music player and take turns to Limbo! Limbo is a dance form and while dancing you need to go under the rope, tummy side up, without any part of the body touching the rope/string. In every round, the height of the rope is lowered so that eventually it’s almost impossible to cross the rope from under it. Toy limbo sets are also available in case you want to use them to play. It’s dance, music, sport, and entertainment combined! Tug of war is one of those outdoor games that was once part of the Olympics. 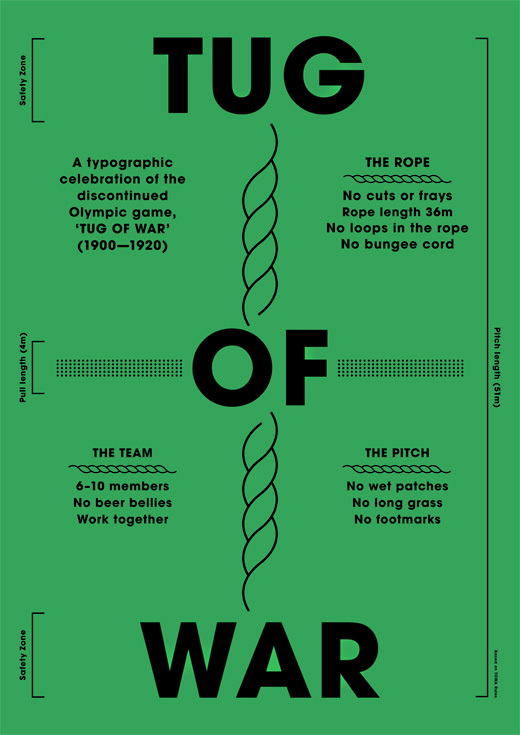 If you want to give your child the feel of an actual game of strength, play tug of war with the original rules of the game, as played in the Olympics. It’s a great way of building physical strength and dexterity! Divide yourselves into two teams. Each team holds a long rope from each end and tries to pull it towards them. All team members pull the rope together on each end so this game teaches the players a lot about team spirit and effort. The fun of tugging the pole and laughing as you do it is unmatched. So, do try it! Trying to teach your child to stand straight in a line? Play this outdoor game and teach you child that. Plus, have fun! Using chalk on concrete or with a stick on sand, draw a line of 2 metres in length. 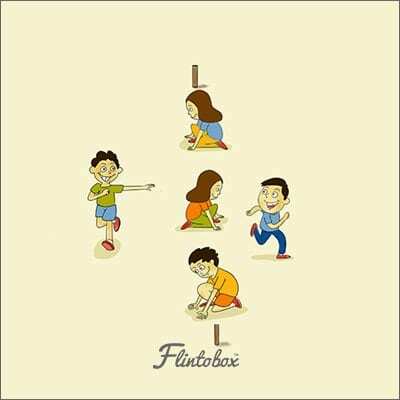 Children have to wait huddled together in one designated corner till the line is drawn and the whistle is blown. Once the whistle is blown, the children have run and fit themselves on the line—like a queue. Those who are unable to fit on the line are out. The line keeps getting shorter after each round and players keep getting eliminated till one of them remains and he/she is the winner. So hurry and draw the line! 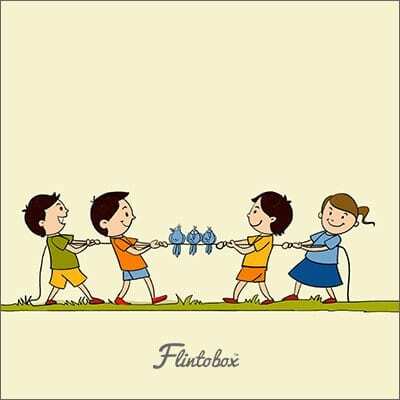 One of those outdoor games that also teaches children to count. Excited to play it? In a large play area, players move around in a circle. One leader is chosen—ideally an unbiased adult. As the players move in a circle, the leader suddenly says a number. The players have to group themselves in that number and all the extras are out. As the games progresses, more and more players are eliminated and one winner remains. I’m sure as little girls and boys, all of us have jumped rope. I used to call it skipping ropes and it was loads of fun to skip ropes in a group. If you’re looking at easy yet involving outdoor games for your little one, this one is just right for you. Get a skipping rope and decide on a play area where the ground is sturdy. Slippery and sandy areas are not too good for this game. In groups of two or three, jump the rope while two players (ideally adults if kids are too young to manage) hold ends of the rope and move it in a circular motion. Take turns to jump the rope and have lots of fun. The best part is that rope jumping can easily be done alone so your child can play outdoors even if he/she doesn’t have company. 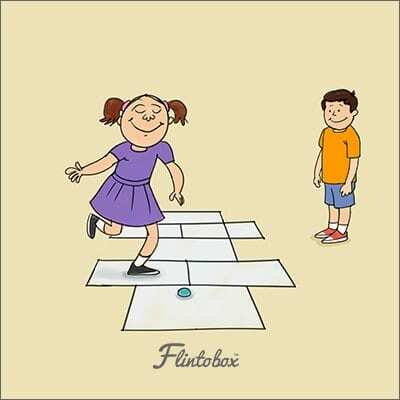 In Hindi, Kanche is known as marbles and the game of marbles is very common outdoor game. Draw a small circle on the ground you’ve chosen to play in. The idea is to shoot these marbles in the centre with a marble in your hand. Shooting is done by flicking the marble using your thumb and knuckles. The number of marbles in the ‘X’ pattern that move when you throw a marble at them, are yours. If any of the marbles moves out of the circle, then you lose a point. You have to place a marble back at the centre. Taking turns, the game continues till there are no more marbles to win. 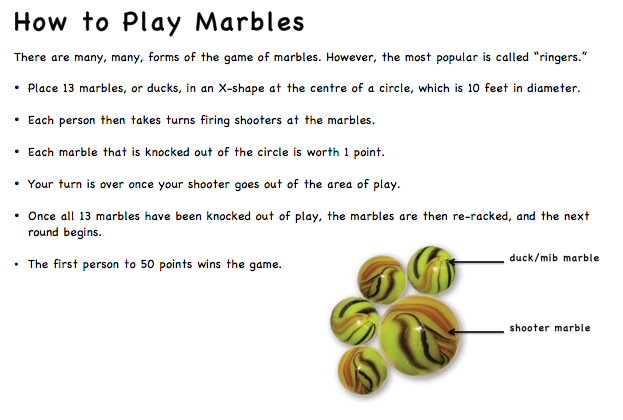 You can make your own rules of marbles as you go on. The idea is to enjoy the outdoors, isn’t it? To conclude: Benefits of playing outdoor games for children! Well, you have a handy list of outdoor games here that you can try with your child. We have a game for each age group but you might question what’s the need of playing outside in the dirt when your child can play in the cozy environment of your home? Playing outside in the dust and grime builds the immune system of your child. He/she is able to fight bacteria and germs better when the body is exposed to the environment outside. The sun is a direct source of vitamin D! Stepping out in fresh air improves blood circulation that helps in improving digestion and generally, in keeping the child fit. Playing outdoor games makes the child more socially adept. Team play and coordination are required to play most of these games. So, what are you thinking? With numerous benefits awaiting your child, take him/her outdoors and get started with a game of your choice. Do you play outdoor games with your child? Share a few of your game ideas with us. Comment now! is there a pdf for this.could you please send on my email id. great article.